Sweet and Spicy Roasted Pumpkin Seeds -- Happy Halloween! One of the things that Ken and I were most excited about when we bought our house was the prospects of a garden. 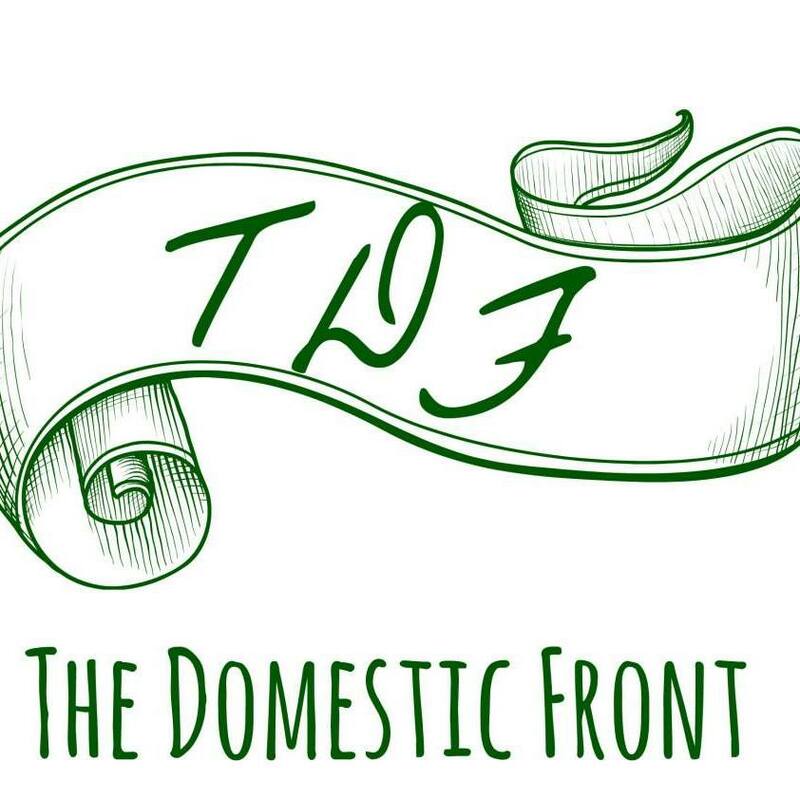 We had managed to make do for years with the tiny terraces in our apartments — we have a dwarf Meyer Lemon tree, a Bearss Lime, and a thriving herb garden. But the possibilities of growing things for ourselves was intoxicating. We were overjoyed to discover the delights already in the offing — ornamental plums (too sour to eat, but good for jam), peach trees, a pomegranate tree, and my favorite, the pineapple guava, which I recognized because it’s identical to the spreading one growing in my grandparents’ back yard. A garden, it turns out, is a work in progress. We put in blueberry bushes and raspberry canes, planted a second pomegranate tree, and ordered greengage plum, quince and persimmon to plant this winter. Of course, the plants we added will take a few years to bear fruit. We moved in too late for the plums, the peaches dropped all their fruit before it was ripe, and the pomegranate turned out to be non-bearing. But we’ll still have a bumper crop of Meyer lemons this winter, and the pineapple guava did not disappoint. 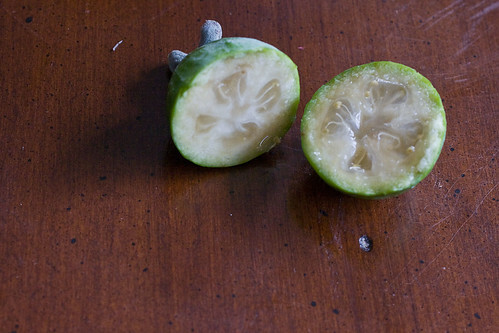 Pineapple Guava, or Feijoa, is a native of Brazil. The tree sports dark green and silver leaves, with dark red fuzzy blossoms that bloom in the Spring in Southern California. This fall, the tree has been laden with the fruit — ovoid spheres of a pale dusky green tipped with the remains of the blossoms. We’ve had enough that both us and the squirrels have been satisfied. I eat them the way my grandfather taught me — splitting the skin with my thumbnail, then sucking out the perfumey, sweet tart jellied center and scraping out the grainy flesh with my teeth. When I’m being more polite, I use a knife and a spoon. The flavor is reminiscent of a ripe pineapple, with the balance of sweet and tart, but with a more aromatic edge and a texture closer to guava. 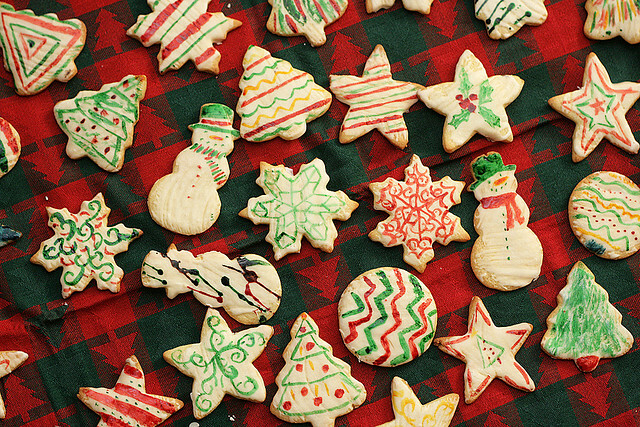 We’ve been pretty happy eating them plain — they’re that good. But if you’ve got any feijoa recipes, I’d love to hear them! Guava’s but I didn’t know how to eat them. Thank you! Gardening really is an adventure, isn’t it? I’ve never seen pineapple guavas before. I hope this is one of those situation where once I learn about something, I see it everywhere–because I’d love to try one! I love feijoas. I’m from New Zealand. We have feijoa candy and drinks and feijoa vodka. I was just checking in and enjoying your blog – (that pie and your crust look wonderful) and then I read this fantastic post. 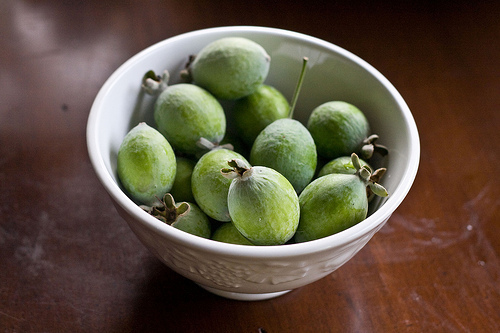 I just read about these feijoas recently and wanted to learn more. I love that you have a tree –lucky. The pics of scooping the fruit out are so lovely and I can almost taste that juice. Brava, Kate! I thought you might be interested in pineapple guava jelly recipe. I inherited it from original homeowner who planted trees in the 1950’s. I have owned since 1987 and have enjoyed them since then (along with the squirrels, raccoons and rats). Usually I eat, but when crop is prolific I scrounge for uses (besides giving away). Can also make breads, like zucchini or banana. Jelly recipe from old MCP Pectin recipe sheet (no longer available). Recipe must be followed EXACTLY otherwise you will end up with a lot of runny juice, too thick for syrup and too runny for use on toast. Uses for runny recipe include sweetener for cereal, etc..
How to prepare fruit: Slice guavas 1/8″ to 1/4″ thick. Place in large saucepan. Add 3 cups boiling water (to just cover) and 1/2 cup lemon juice. Crush fruit well. Bring just to a boil (can simmer up to 10 minutes very low heat for extra yield). Prepare juice: Strain in cheesecloth or jelly bag, yield, 3 1/2 to 4 cups. Make jelly (yield about 7 cups): Place 3 1/2 cups juice in saucepan. Must use exactly 3 1/2 cups (add up to 1/2 cup water if necessary). Measure 6 cups sugar in separate bowl. Do not reduce amount of sugar or use sugar substitute. Add 1 package pectin (any brand) to juice in saucepan. You can add oil, about 1 to 2 tbsp, such as grapeseed (neutral flavored and heat tolerant), to reduce foaming. Slowly bring to rolling boil, constantly stirring. Lower heat then slowly and carefully stir in sugar then increase heat and bring to rolling boil again. Skim off foam. Immediately place in jars while boiling hot. Let sit to cool. Produces clear yellow jelly, reminiscent of ripe guavas. Very unusual and delicate flavor. One of my favorites. Thanks so much Eric. Unfortunately, the squirrels have been active this year, so we don’t have enough for jelly, but I’m tucking it away for future harvests! You can eat the skin, too! It is tangy but delicious. Hi — I understand I probably need 2 trees for fertilzation; does it matter as to if they’re the same variety or not? Mitch — I am far from a horticultural expert, but I will tell you that we don’t have two trees, and our one is very prolific. I can’t speak for our neighbors though — there may be other trees that are cross pollinating in the neighborhood. Can’t find any anywhere is there a place in Orange County to buy them. Reminds me of my grandpa when I was a kid. We are looking at buying pinapple guava trees, but we an’t find anyone that has a tree. Are they a lot of work? Does the fruit fall off and make a mess, or is it more like citris and stays on the tree until it is picked? Would you say they are a clean tree over all, or do you need to pick up a lot of dead leaves and blossoms? When the fruit falls off, it’s ripe. It’s a beautiful thing to discover the fruit on the ground, and not a mess at all. Very clean tree, no mess, but you will want to prune it occasionally. Can be pruned to be a tree or a shrub, espalier, whatever. Takes care of itself, otherwise, and doesn’t seem to have any bugs or other problems. I have 14 of these trees and we sell the fruit, jam, leaves for a healthy tea and sproutlings. These are wonderful trees. You must have at least 2 though. If your only going to have a couple of Feijoa trees choose your breed carefully you need at least one that is a pollinator. 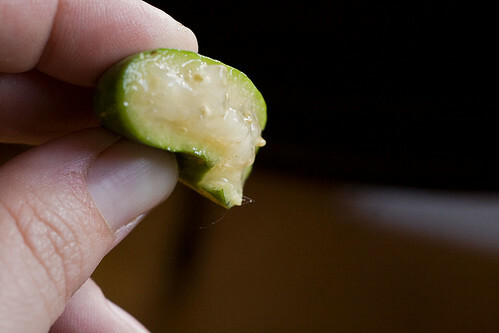 Feijoa is very big in New Zealand though I don’t think I’ve ever heard them referred to as Pineapple Guava. They are very aromatic more so than any fruit I can think of. The feijoa is great in smoothies or juiced. You can use some of them to replace apple in a crumble. I have pineapple guavas but they have no fruit only flower buds. I have had for a while now like 3 years. We have a pomegranate tree with the same issue – people like the flowers but don’t want the mess of the fruit. I always think it’s sad. It wouldn’t be uncommon not to see anything in the first 2 years, but on the third year you should start bearing fruit. Feed it well with compost in autumn and nitrogen rich fertilizer during winter. You might also need to get another tree if you dont have one that is a polinator check with your local nursery I use Waingaro for polination of my other plants but it would depend where you are as to the breeds you have available. If bee populations are low in your area you could also use a small artist brush to wipe the pollen from one tree flowering with its neighbor this will help cross pollinate. Thanks for chiming in Robert. I know with some trees there are also non-fruiting strains, and volunteers often don’t fruit, sadly. We eat the whole guava–skin and all, but we get such a huge crop that we can’t keep up with them. Now I take them and dry them. I’ll cut them into 3, 4, or 5 sections, depending on their size and dry them overnight (6 to 8 hours at 135 degrees). They’re like candy. The kids and grandkids love them. Makes a great snack food. I’m trying applesauce today. I saw a recipe that calls for 3 apples to 25 guavas. JELLY RECIPE: I have a huge crop this year, and they just started falling from the tree this week. However, I have one recommendation regarding the recipe. When making the jelly, use bottled lemon juice (rather than fresh lemon juice) because it has a predictable level of acidity that is necessary for the jelly to “jell”. Also, do not use Meyer lemons or their juice because they are not true lemons and definitely will not be sufficiently acidic. betty, a little late but Claussen Nursary in Bonsail, Ca has pineapple guava and lots of exotic fruit trees. Super guys there. We also inherited our tree (one only)when we brought our home 12 years ago. This years crop is out of control. Good to know you can eat the skin – I have been scooping with a spoon. I really like the blossoms in a salad but I don’t take too many. We need as much of the fruit as possible otherwise the squirrels win and we loose. It’s like a green egg hunt every evening when I get home from work. YUM !!! Getting fruit away from squirrels is definitely our biggest challenge! Does anyone have a recipe for PINEAPPLE GUAVA JAM? I have looked high and low for a recipe. My pineapple guava tree is outdoing itself this year hence I searched for a recipe to preserve the womderful flavor. I’m going to make some jam/preserve right now! Scoop out enough gelatinous centers of guavas to fill 4 C and put into a pan. Quarter a tart apple and add to the pan. Tie 2 cinnamon sticks and 1 tsp allspice into a cheesecloth bag and add to pulp. Cook guava pulp and apple with a squeeze of lemon juice for 20 minutes. Remove bag of spices and reserve. Put pulp through a colander or strainer. Put strained pulp back into pan and add grated peel and juice of 1 Meyer lemon and 1 orange and the reserved spice bag. Squeeze lemon and orange juice into a measuring cup and add enough lime juice to equal 3/4 C. Add citrus juice to pulp along with 2 tsp of freshly grated gingerroot and 3 C of sugar. Cook for about 45-55 minutes or until jam sheets from a spoon instead of separating into two streams. Pour into clean, hot jars, seal, and process in a boiling water bath for 10 minutes. Yields five 8-oz. jars of jam. I’ll definitely have to try that if we can keep any out of the kids’ hands! 4 varieties of guava;2 need 2 trees to propagate and 2 don’t. Choose carefully if you want to plant only one tree. Usually the jelly will turn from light ruby to deep ruby red naturally. 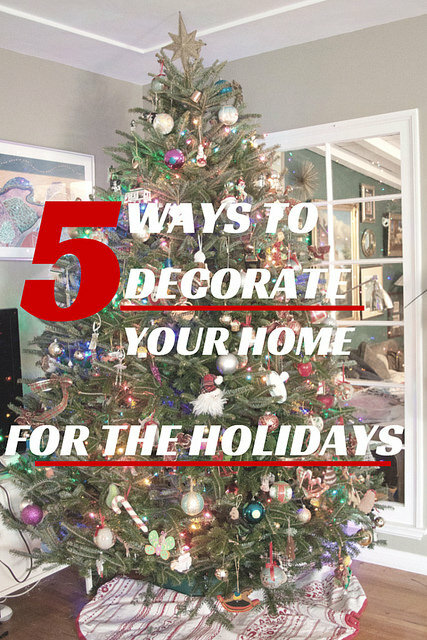 We’re from Covina, CA, and also San diego and in both places we have only one tree and prolific harvest. Thanks for the info. I don’t think the pineapple guavas turn red in jelly, though the other kinds of guavas definitely do, and they also grow around here. I have a very big pineapple guava tree and it has so much fruit every year that I end up tossing most of it out. Any Suggestions? 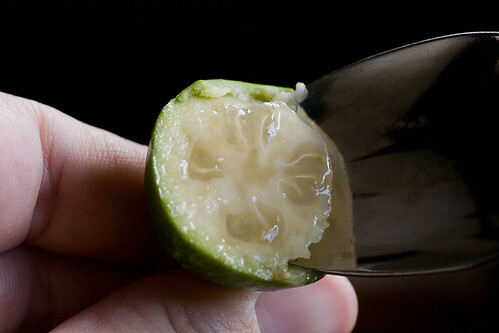 Janine – we can’t get enough of eating them out of hand, but I’ve heard some folks use the guava to flavor a liqueur. If you try it, let me know how it turns out! We bought a home with an established tree. It is prolific in fruiting and has no partner for pollination. I have used fig jam recipes but not really satisfied with that. Sure would like a good recipe for the pineapple guava after 8 years of efforts. …located 50 miles from ocean in south Georgia. Ours doesn’t have a partner for pollination either – at least not in our yard. The challenge is getting to the fruit before the squirrels do! Janine – try making guava fruit leather, then you can enjoy it all year, or smoothies or jam. I found the old MCP pectin recipe and have bee using it for years, with reduced sugar. We inherited our (1)bush 17 yrs. ago with the property. It produces more than we can eat or give away. Our location is south Louisiana, and it produces better than the peach trees. We also have Japanese plums that are very plentiful if the freeze of the winters don’t kill the blossoms or freeze the fruit. we have made a simple pancake syrup of the guavas. I just copied a jam recipe, so that will be a new endeavor, I’m sure. Good luck to all. I have one pineapple quava that is covered with fruit in West Covina. If the jelly is turning red I believe you have a strawberry quava. They are wonderful with thin skin and deep ruby color. I made quava jam many years ago and it was a welcome gift to my friends. This was our first year with our bushes (3) producing fruit and I spent hours getting the fruit out of the skin, can jam be made with the skins? maybe if I put it in a food processor? I don’t know that I will have to patience to peel them every year. Bill, I haven’t made the jam, but the skins are pretty bitter, unfortunately. When I was a child in southern California, we had a pineapple guava bush and we would eat the fruit spooned out of the skin either straight, or with milk on it (it sometimes curdles a little). My mother would save the peels in the freezer, and when she had a lot, would make jelly with the peels. I wish I knew the recipe, but I didn’t get it before she died. I’m pretty sure it was just pineapple guava, water and sugar, maybe she used sure-jell, but I don’t think so. Anyone else ever done that? What proportions?